Before I bought my current car, a 2009 V10 M5, I used to own a modified 2008 Lexus IS-F with a V8 that had just the right amount of power—about 440 horsepower and 410 lb-ft of torque—to make me want to look for excuses to drive. Even if I had just drank a Cherry Coke, I’d go to the store to buy a Fanta anyway and take the longest route possible. With the M5, these days, I feel the same compulsion. Even though the M5 generates a similar amount of power as the IS-F—500 HP, 383 lb-ft of torque—the way these cars deliver the power is vastly different. But rather than just explain all of this to you with words, I wanted hard numbers, facts, because I always deal with facts. Not really, I mainly rely on feelings. But when it comes to power I take it seriously. So I took my M5 to the same dyno where I had previously taken my IS-F. Here’s a clip from that session not too long ago. The dyno is located at Eurocharged ATX where they do more than severely disappoint you with a dismal two horsepower gain after you’d hoped to get thirty hard-charging ponies from that thousand dollar cold air intake install. They have a pretty efficient setup in their shop. An AMG gets dropped off, Eurocharged tunes it, throws it on the dyno, re-tunes it, throws it on the dyno again and then releases it into the wild. This happens all day long, a magical factory assembly line unleashing brutal, unconscionable levels of speed upon the world. My M5’s power generation capability paled in comparison to all these machines and was completely out of place like a buffalo being introduced into a lion’s den. It’s fun to throw your car onto a dyno because it gives you the opportunity to stand inches away from the car and listen to the car unleash its roar without actually moving. 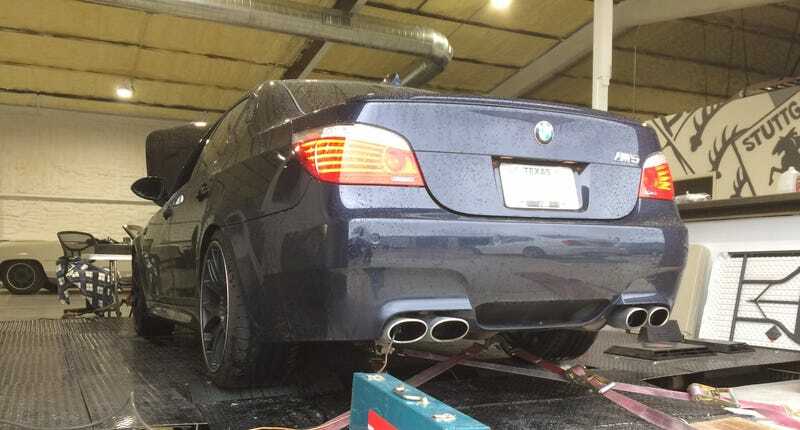 Under full throttle with the M5 strapped onto the dyno it screamed with so much rage—begging to be freed. Listen to this clip below. I’m always a bit worried with the M5 because you never know when that V10 will blow up. On the dyno, with the car being pushed to the limit, it’s a lingering concern that’s now magnified by a hundred. Who knows at what point a rod would fly out of the engine at 8000 RPM, but fortunately, nothing bad happened and the car is still intact. Maximum horsepower of 454 HP! That’s definitely more than I was expecting. Typically wheel horsepower is down by about 15-20 percent than the factory stated output at the crank due to drivetrain loss. With the M5, however, there only appears to be about a 10 percent decrease from the spec’ed output of 500 HP. The maximum torque figure is at 340 lb-ft which I thought would be lower as well, but don’t get me wrong, I’m more than happy that the numbers were higher than anticipated. Comparatively, the IS-F produced 376 HP and 350 lb-ft of torque. To visualize the power curves for both cars easily, I’ve painstakingly transferred the numbers for both the IS-F and the M5 from the dyno sheet into Excel. As you can see, to squeeze all the power out of the M5 you really have to ratchet it up with the V10. From a normal daily driving perspective this just isn’t realistic. What are you going to do? Floor it for ten seconds followed by slamming on the brakes? In my everyday driving I usually shift in the 4500-5000 RPM range where there’s roughly a 30 HP difference between the M5 and the IS-F. This means that my old IS-F actually drove faster than the 500 HP M5 around town! What’s even more compelling, however, are the torque numbers. Torque is what really makes the difference from a pure commuting perspective. At 5000 rpm, the IS-F generates 40 lb-ft more torque which falls in line with what I remember—the IS-F has significantly more low-end grunt. If you have a strong desire to prove to other drivers who can do a faster 0-30 mph time in between stoplights, then get an upgraded IS-F. It will provide you that quick jolt of acceleration that the M5 can’t. But when the road clears, that’s when the M5 is spectacular. If you are able to find an open road or a toll road where the M5 can stretch its legs, there’s no comparison. If you look at the charts above, you’re going from 375 HP to the wheels to 430 HP to the wheels between 6000 and 7000 RPM. At that range, it feels like you’ve used a cheat code and unlocked extra power because the car pulls harder and harder. It’s not even tough to get to that level because the V10 is extremely rev-happy. At this point, my old IS-F would have no chance of keeping up. Few other cars would. At a track, I’m sure the M5 would run circles around the IS-F with more horsepower, sharper handling and overall track mastery. What people don’t realize is the M5 is deceptively tame. It’s easy to be disappointed in the M5 if you never rev the engine that high. Below 5000 RPM there’s not much to get excited about. Most cars won’t allow you to go beyond 7000 RPM into galactic territory but peaking out at 7500 RPM is where the M5 truly comes alive and it’s how the Formula One-inspired V10 was designed to operate. The M5 is about unleashing the beast without being afraid. Let it explode and push it as hard as possible until it literally explodes and you’re left sitting by the side of the road with a broken M5. Despite the looming risk of V10 M5-ownership, the car provides a driving experience that can’t be replicated. It’s an unparalleled machine that can also give you an unparalleled sinking feeling of despair.